So this year may be different. I might have to wear real clothes for the first time in 14 months. I may have have to un-button my pants when no one is watching. I may have to focus on getting my son fed before I fall face first in a pile of turkey and cranberry sauce. That kid always gets in the way of my pigging-out sessions. Since my maternity jeans are folded and stored, I think it means I should make a healthy side dish for our Thanksgiving get-together this year. Healthy and Thanksgiving is an oxymoron, but you know I wouldn’t leave you debating between happy indulging or hungry self-control. That’s why I created THIS! 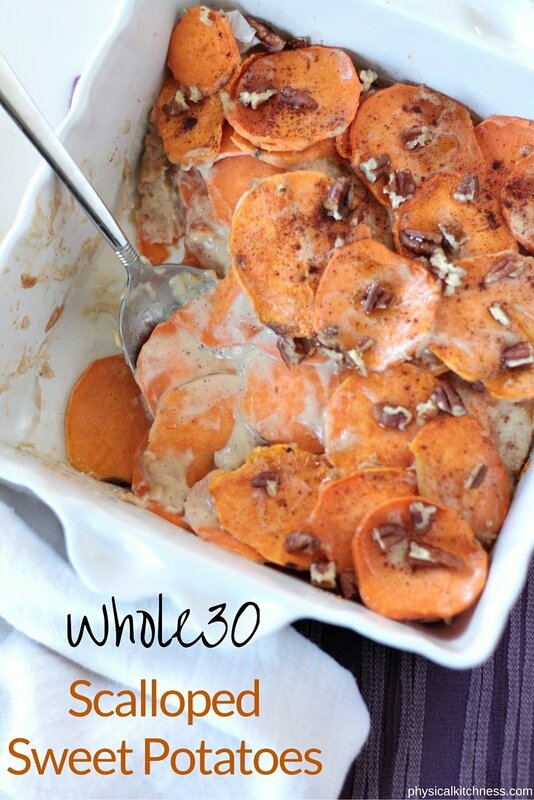 Whole30 scalloped sweet potatoes. A grain-free, dairy-free, sugar-free side dish that has THE most decadent creamy layers you’ve ever shoved in your mouth. We live thousands of miles from our families (sigh, the life of the military), so Thanksgiving with new friends has been the standard. Inevitably, there is always one or all of the following at our Thanksgiving get-togethers: the vegan, the paleo eater, and the “just give me FOOD” (usually in the form of a man) chowhound. 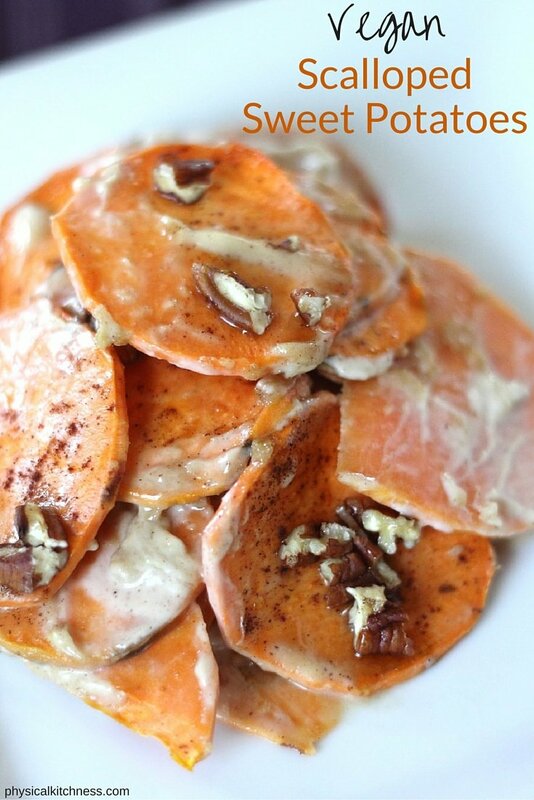 This vegan, paleo, Whole30 scalloped sweet potatoes side dish will SATISFY THEM ALL! 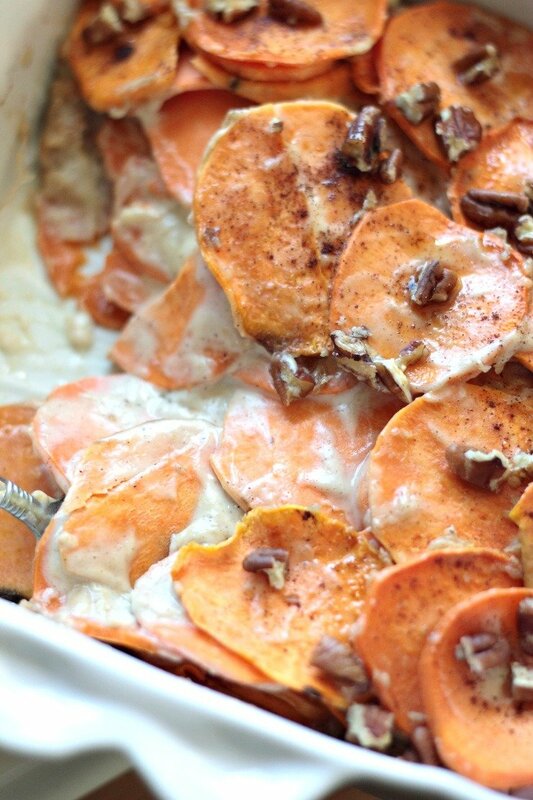 A dairy-free scalloped sweet potato recipe you ask? Um yeaaaah! Only five ingredients? Double yeaaaah! 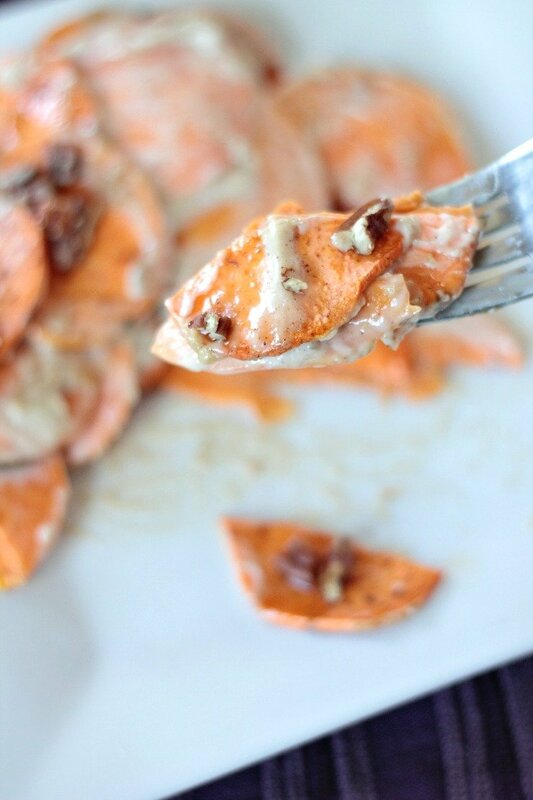 You won’t believe how amazing sweet potatoes taste with a rich cinnamon date cashew cream and crunchy pecans. The best part is, it’s ridiculously simple to make. No no, the best part is that the creamy sauce tastes like heaven. Ok, start over, the best part is this will be a hit at your Thanksgiving dinner AND you don’t have to feel bad eating it AND it makes amazing leftovers AND you’ll probably make it your signature side dish. That’s a lot of AND’s. Which means this recipe is legit. To start, use a vegetable peeler to remove the skin of two large sweet potatoes, then cut them thinly (1/8” thickness). In order to get uniformity, I used the thin slice attachment on my mandoline slicer. Now it’s time for the sauce. 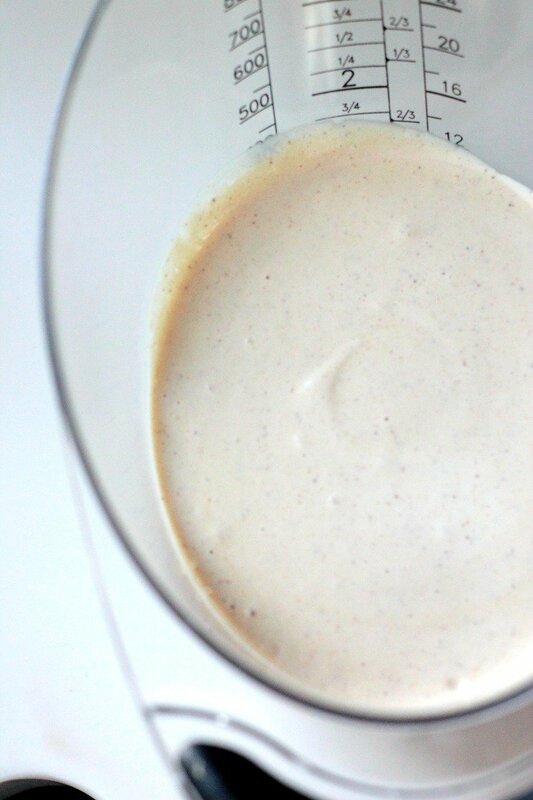 Soak 1/2 cup cashews in water overnight, drain and place in a blender and add 1 cup coconut milk. 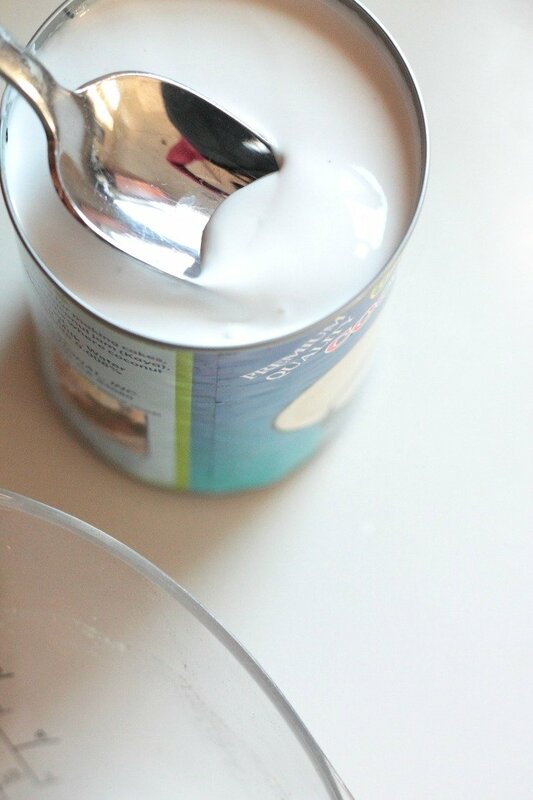 Go for the stuff at the top of the can for a rich cream. Then add 2 dates to the blender and 1/4 tsp cinnamon. Blend until well combined. Grease the bottom of an 8×8 casserole dish (or line with parchment paper) and start to layer the sliced sweet potatoes on the bottom. Drizzle about a fourth of the cream mixture on top. Continue to layer the potatoes and the cream until you have about four layers. Drizzle the remaining cream on top then place in the oven at 350 degrees for one hour. Garnish with pecans if desired. You can make this dish a few hours or even a day ahead of time. Just let cool then refrigerate. When ready to serve, place back in the oven at 250 degrees for a half hour or so, just enough to warm throughout. Ok as promised, here was my nirvana moment. Once I blended the cream, it took all the willpower in the world not to literally drink it straight from the measuring cup! Which can only mean one thing – it would taste amazing as a coffee creamer. So go ahead, double the recipe. Your mornings will never be the same again! 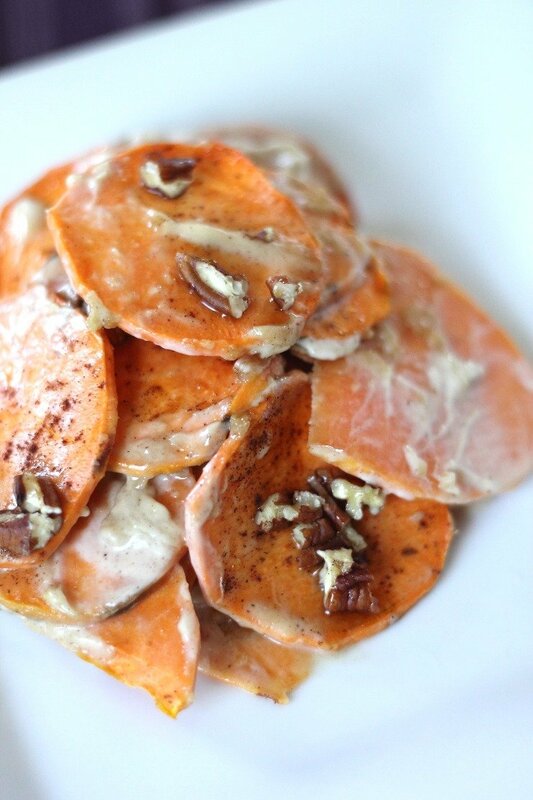 Peel and slice the sweet potatoes ahead of time and store in an airtight center in the refrigerator. You can make the cream ahead of time and store in the refrigerator, but be sure to bring back to room temp (or warm slightly in the microwave) before you assemble the dish, as the coconut milk might solidify a bit once chilled. 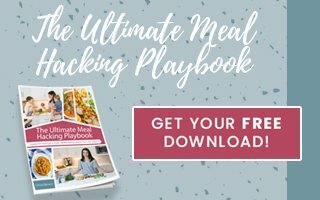 Curious to try The Whole30 or eat a week’s worth of healthy, real-food meals? 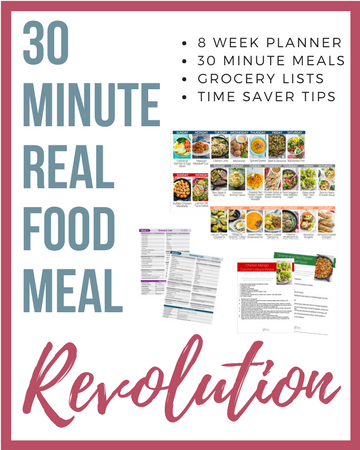 Check out this Whole30 meal planning guide filled prep tips, recipes, and a coinciding grocery list! Who knew Whole30 could be so simple (and so good)?! This sounds so good! 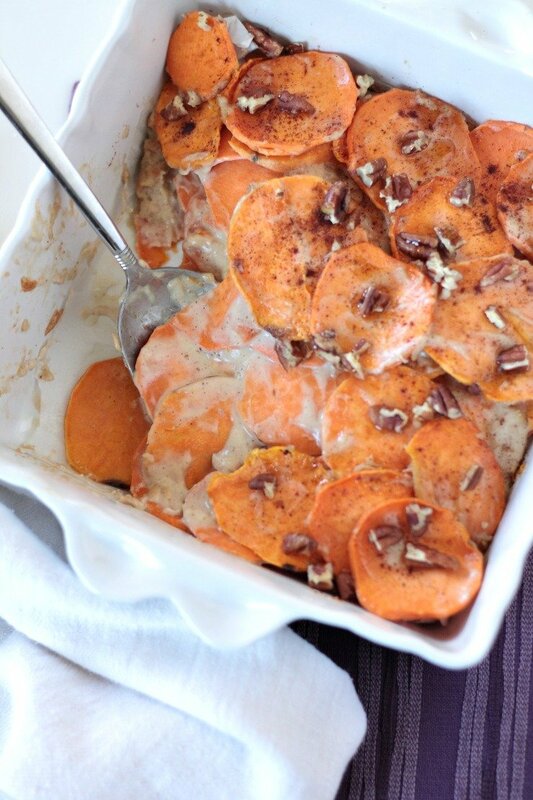 I love my mom’s scalloped potatoes, but I much prefer sweet potatoes over white. This is the perfect combo of the two!! YES! If anyone out there is as OCD as I am about planning for major holidays, this will come in handy a few weeks before Turkey Day. Thanks Laurie! 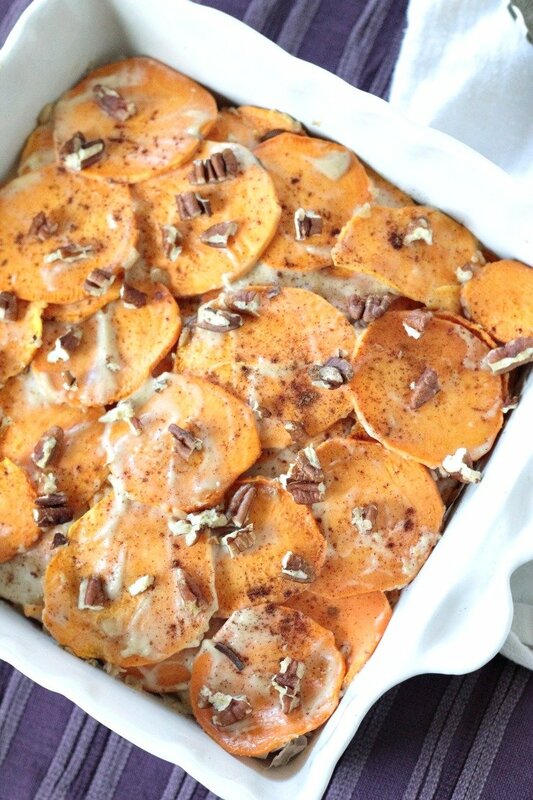 Ooh I LOVE this cinnamon pecan business on top – sounds amazing! I don’t think I’ve ever actually made scalloped potatoes but since I avoid dairy these ones are definitely going on my must-make list. Also, I hear you on being away from family. My dad lives in the Middle East and my mum is a 4 hour flight away, so this (Canadian) Thanksgiving was more of a ‘Friendsgiving’ than a family affair! WOW your family is far away Angela! I hate the distance but I do have to say, ‘Friendsgivings’ are pretty fun too. This will be a great recipe to try for your dairy-free diet! Thanks for stopping by. oh my gosh I love your description of how you might have to just sit back and go for the elastic this year. 🙂 The recipe looks amazeballs as well! There is a reason why elastic was invented. I think I am that reason! 😉 Thanks Amanda! SERIOUSLY freaking good. The cream – Kat I wouldn’t lie to you – is amazeballs. I polished it off for lunch today. Hehehe. Let me know if you try it! Oh. My. Word. I have been looking for a recipe to take to sister in law thanksgiving and this is it. Cannot wait to make it. Do you think it will be okay to cook it, take it and warm it up again? YAY! I would be so honored if you brought this delicious beauty for your Thanksgiving feast. Please keep me posted! Absolutely ok to cook it beforehand and warm again. In fact, I just finished the leftovers today! Just cover and store it in the refrigerator then when you are ready to warm it up again, I’d place it in the oven at say, 250 degrees for 20-30 minutes, until warmed throughout. Thanks Heather! These potatoes sound fantastic!! My family would love them! This looks like a really comforting recipe. Comforting because the ingredients are so good for you! I don’t eat dairy so I am always looking for dairy-free recipes that will please everyone. This recipe is very inspiring. Thank you and congrats on your new mummyhood journey. Thank you Christine! I know Thanksgiving sides can be tough for those that are dairy-free. I hope you love this dish as much as my family does! Super simple but full of FLAVAAAA! Hope you love this Sarah! OMG I almost didn’t believe you when the post was titled Whole30… these look absolutely decadent! I’d love to make these for Thanksgiving and not tell anyone they were Whole30 and see what kind of taste test reaction they get. Thanks for sharing, definitely trying this in a few weeks! Oh girl you know I won’t deceive ya! For realz, you should make this and just see what people say. No one ever believes that healthy dishes can be so decadent. But this one is my friend! Joanna you are a brave lady. I’ve never hosted. It’s not that cooking all that food intimidates me, it’s the ‘figuring out where everyone will sit’ kind of stuff that stresses me out! This dish is super simple and keeps well in the fridge! TOTALLY! Key is, don’t tell anyone it’s healthy or diary-free or gluten-free. THEN when they all love it you can break the news. I love doing stuff like that. People are always so surprised! Thanks Brittany! Looks like an amazing dish!! YUM! I love the addition of the cashew cream. This dish looks so yummy. Can’t wait to try! YAY! I am not kidding when I say you may lick the cream off any plate or dish. It’s THAT good! NICE! I love that idea Kerri! So glad this post found ya! Keep me posted how it turns out. This dish looks amazing! I could see mixing it up with curry or other spices, too – yum! Oh that is a fantastic idea! Thanks for the inspiration Alisa! This looks amazing! And I love sweet potatoes. 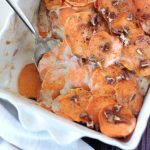 I was just looking for something different from our usual sweet potato Thanksgiving side dish. I’ll happily loan you this recipe to replace the ‘usual’ sweet potato side dish Christine! What an innovative dish! Love your time saving tip too – so helpful, especially when cooking for the holidays! Thanks Jessica. I’m all about saving every minute I can. You are right, cooking for the holidays, ESPECIALLY! Oh my, these do look good. Of course, I love all things sweet potato, but scalloped? Yes, please! Oh yes, scalloped is where it’s at Renee! Thanks for stopping by. Enjoy! I would have never thought to scallop sweet potatoes. Great idea. Ditto Jess! My family used to have them with syrup and marshmallows and brown sugar. EEEEK! Want this on my Thanksgiving table, for sure! YAY! You won’t be disappointed Rachel! mmmm making these for Thanksgiving and an extra batch of “sauce” for coffee creamer!! That is a fantastic idea Shar. Smart, very smart. WOW these look like straight up DESERT!! Can I eat this instead of pumpkin pie?! Of course you can!! Please do. You will want to drink the cream. It’s sooooo insane! This looks delicious! About how many people would an 8 x 8 dish of these serve? Hi Kara – it largely depends on the serving size per person, but I would guesstimate the dish could serve around 6. Thank you for stopping by! I made these for Easter. It was so good. Easy to make and tasted delicious. I garnished mine with walnuts instead. Needs a little bit more cashew cream though. Not a whole other batch, but maybe 1/4 more. Hi Lisa – thanks SO much for the feedback. I’ll have to make this again and adjust. Glad it was a hit! YAY HAPPY DANCE! Thanks for the awesome feedback Monique. So glad you loved it!